This is the writing Calley did in 1985 in a handcrafted, cut and paste booklet on Taking Their Proper Place in History. 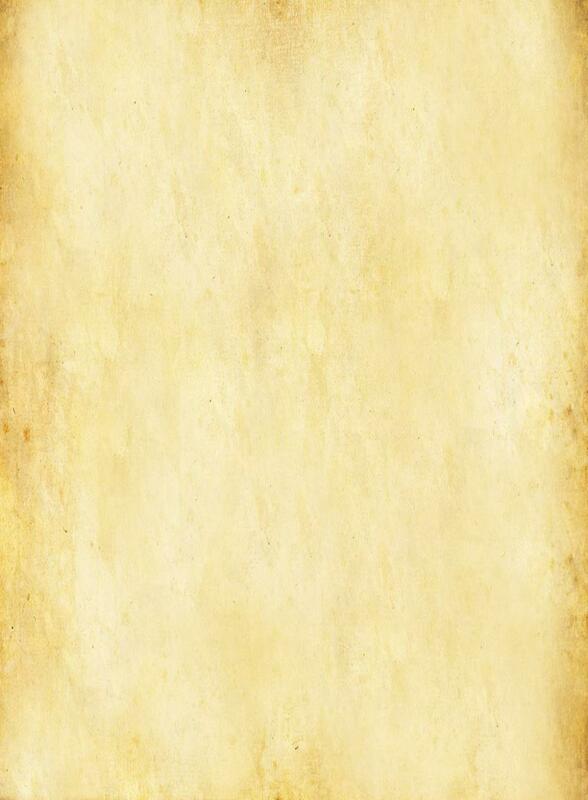 There is no practical way to update the lives of all these craftspeople, so the information stated was current in 1985. The mural was begun on March 1, 1983. The concrete walls were stripped of years of paint layers through grinding and sanding. The wall was then spackled and sanded four times and sealed thrice with Politec, paint of the Mexican mural masters and first acrylic paint in the world. Few people in the world realize that Mexicans created acrylics. 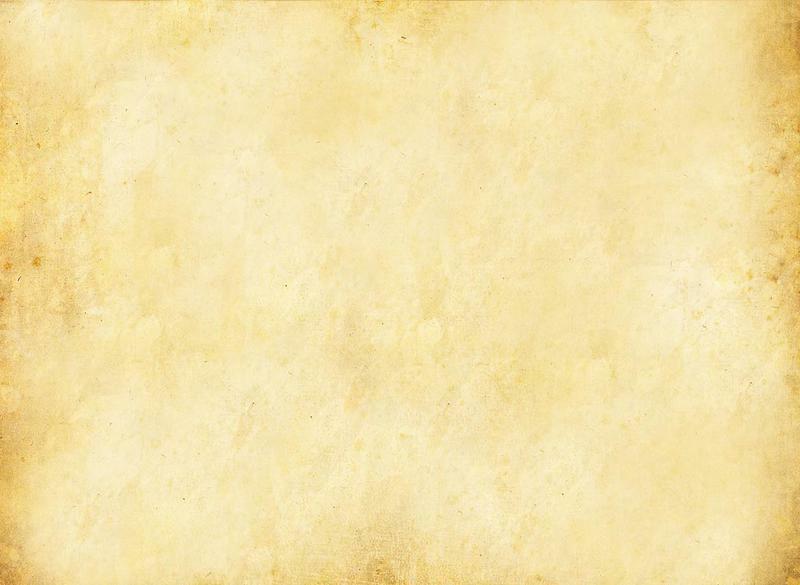 The Mexican mural masters, particularly David Alfaro Siqueiros, and a team of chemists developed Politec at the Polytechnical Institute in Mexico City. For Siqueiros, fresco was far too slow and cumbersome a process for the direct expression of passions. Created to surpass the age-old technique of true fresco both in luminosity and ease and speed of application, this is the finest acrylic paint in the world. Calley has used Politec exclusively in both her easel and mural paintings since 1976, when she found it during research for her first mural. The most makai aspect of the mural has two facets, above the windows, a view of the old Waikiki Duck Pond, circa 1900, and below, the boys on beach, which references an intriguing photo by famed photographer, Ray Jerome Baker (1880 – 1972). The most accomplished photographer of his day in Honolulu, Baker’s work still informs and inspires anyone looking at the changes over time in Hawai’i. 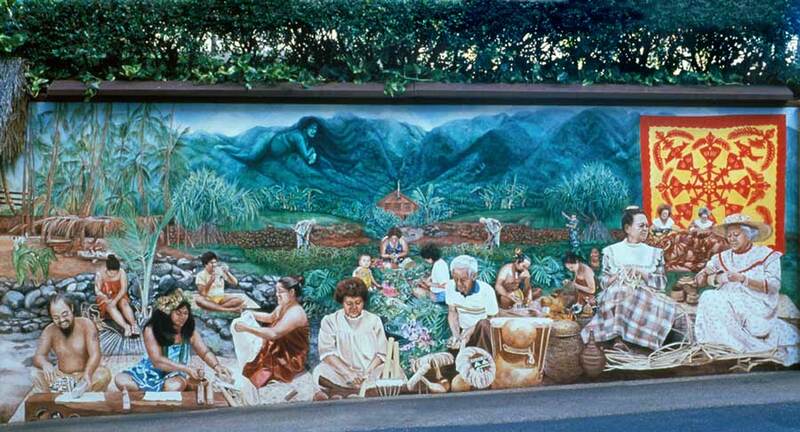 Primarily this mural honors the craftspeople of Hawai’I, then and now. As these were and continue to be botanical crafts, and not precious stones and metals, these treasures have not always received the recognition they deserve. 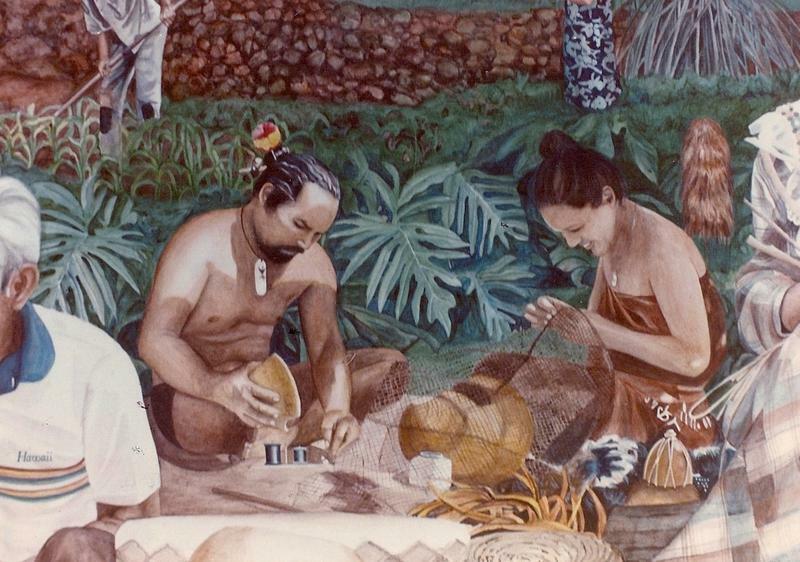 Portrayed in the left hand corner is the very fine kapa (tapa cloth) maker, Carla Napua Freitas from the Island of Hawai’I, assisted by Sanford Fujimori and Carla’s niece, shown grinding olena (local Hawaiian turmeric) to procure a gold dye. The three were photographed on the Fourth of July, 1983,while they worked at Pu’u Honua O Honaunau (City of Refuge) at a cultural festival. Freitas wrote an excellent article on Tapa in Ancient Hawai’I in the Book, Tapa, Washi and Western Handmade Paper, 1981, Honolulu Academy of the Arts. The various carving arts are here represented by the sculpture shed at Pu’u Honua o Honaunau, featuring local craftsman, Keone Nunes of Nanakuli, Oahu. The shed houses specially selected tress for carving and images of the Hawaiian Gods in differing stages of completion. Keone, whose family hails from the island of Niihau, is a knowledgeable and dedicated student of Hawaiian language and culture, anthropology, craft, and hula. He also teaches Hawaiian language. He has crafted fine musical instruments, traditional fishhooks, and is planning on adze making. At the back of Manoa Valley are the Ko’olau Mountains. An avid hiker, and teacher of the mountains since age 63, Silver Piliwale, at 84, has cut and maintains many of Oahu’s favorite hiking trails. Here, Silver represents the craft of Hawaiian horticulture, the basis of Hawaiian society. The Hawaiians were extremely sophisticated horticulturists. They knew and felt every nuance of the growth of their plants, fish and animals, enjoying the most superior diet in all Polynesia. In their horticulture and polycultures, the Hawaiian planters worked in harmony with Papa, the Earth and the forces of nature. In the mountain are found the plant materials for the lei makers. The circle of flowers and/or foliage are one universal symbol of aloha and the welcoming Hawaiian spirit. The lei makers are learning the art of haku lei po’o (traditional braided head lei). The little girl is Dianah Kawehionalani Avilla, who had just celebrated her first birthday. The musical instrument makers are Auntie Freda and Uncle Herman Gomes from Makaha, O’ahu, who teach the construction of almost all the Hawaiian musical instruments at the Bishop Museum Atherton Halau and on the Waianae Coast. Here, she crafts an ‘ohe hano ihu (bamboo nose flute) as Uncles makes a pu’ili (bamboo rattle) often used in pairs by hula dancers. From left to right: the ‘ili’ili (smooth naturally polished oval stones as castanets that are rare and found on certain beaches), triple gourd musical instrument often used as a children’s toy: the whirling sound is produced by pulling and then releasing the center cord. Next is a set of bamboo pipes, ka’eke’eke, also called ’ohe ka’eke’eke or pahu pahu. Holding two pipes vertically, and tapping them on the ground produce sound. Different lengths produce different sounds. Below the pipes is a beautiful knee drum, pu niu, made of a coconut shell with stretched sharkskin. Such beautiful drums can be handed down from generation to generation. In front of that is the pa ipu, or double gourd drum, regularly used for hula. The Gomes also craft ka’la’au, or hard, long sticks used in hula. They make sets of 3 in lengths of 2’, 3’ and 5’ for women and 3’ and 6’ for men. Other instruments include the niu (coconut), clicking coconut half castanets, the pu, shell trumpet string instruments, the musical bow, called an ‘ukeke, often used as a toy. To the right of the musical instrument makers are the feather workers, Iwa and Kealoha Peltier from Kaimuki, O’ahu. Kealoha is carefully sorting feathers stored in a finely homemade gourd container and tying them in tiny bundles. Iwa takes the little bundles and knots them onto the shaped net backing. Here they are working on a cape for their son’s firth birthday, the biggest of all celebrations in Hawai’i. Their work is meticulous and painstaking and their feather garments, leis and kahilis (circular feather plume on a staff) works to behold and inspire. Shown in front of their spectacular quilt of Princess Kaiulani’s Fan are Auntie Kepola Ryan Kakalia, known as Auntie Debbie and her daughter, Deborah Tufanua Ryan Santos (Tufa) work as a team with their husbands, David Kakalia and Solomon Kepo’oku Santos. The men do most of the pin and thread basting, and the women do the fine applique stitching of the symmetrical pattern onto the backing and the actual quilting. Kepola Kakalia has been quilting for over 23 years and is considered a pioneer in her design work and quilting technique. She is a grand lady of quilting, who has been quoted in important books on quilting over many years. Her quilts and pillows have been displayed in virtually every major Hawaiian quilting celebration, and shown in demonstrations and exhibits in mainland museums. Their stitch work is extraordinarily precise, and the impact of the whole quilt, when complete, is breathtaking. Kepola does custom quilts, which are her original designs as well as traditional patterns. I am currently working on a king size Auntie Debby quilt, which will become a fine heirloom, even if it does take me a decade to complete it. Auntie Debbie chose Kukuna o ka la because I wanted to use rust color on beige. She told me that was my only choice! It is a beautiful original design. An update to the 1983 writing ~ alas, that was overly ambitious and as of this writing in 2013, having made very little progress and poorly stored the quilt for exactly 30 years, I have happily gifted the design and the quilt in progress to a very fine teacher of Hawaiian culture and crafts at the Kaulupulehu Cultural Center at Hualalai. Annie Kaleolani Standley is making the quilt in burgundy and cream, so that the unique kukuna o ka la (mangrove flower) pattern can finally be revealed. And so with this closure, I complete the lesson thirty years later of what it really takes to make just one Hawaiian quilt. My more practical dream ~ one day I shall commission a quilter to fulfill my dream of having a Hawaiian quilt. Just below the quilters, painted as they were seated on a coconut tree log outside the Bishop Museum are Kupuna Katherine Maunakea, and her long time friend and assistant Genevieve Ho’ola’I Kahiluonalani Nahulu of Nanakuli, O’ahu. In the background, Mabel Kamahele, also from the Waianae side of O’ahu, picks lauhala for the weavers. Kupuna Maunakea is a long time weaver, hoku pattern maker, seamstress and teacher works undaunted by the fact that she has no use of her right hand. Amazing! The small baskets behind the weavers are old Hawaiian twined baskets of ‘ie’ie (aerial roots of Freycinetia arborea) that one can see crawling up trees in in the rain forests and on Hawai’i Island in ‘ohia forests. Twined baskets were made in various shapes and forms, often woven tightly over a gourd with covers. On the left, Kupuna is wearing a small plaited band around her hair, and Ho’ola’i is wearing her grandmother’s hand-woven hat with a headband of fine shells, carnations and tuberoses.